1.Out of the first four stores F. W. Woolworth opened, three failed. When he died, he was worth more than $20 million. 2.Einstein was 4 years old before he could speak. 3.Isaac Newton did poorly in grade school and was considered “unpromising”. 4.Beethoven’s music teacher once said of him, “As a composer, he is hopeless”. 5.Michael Jordan was cut from his high school basketball team. 6.Walt Disney was fired from a newspaper because he “lacked imagination, and had no good ideas”. 7.Thomas Edison’s teacher told him he was too stupid to learn anything. Later, he tried 1,600 different materials before settling on carbon as the filament for the electric light bulb. 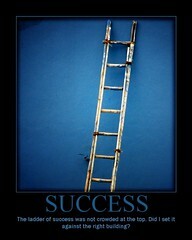 As a parent, what do you do that you feel you really “succeed” at? What areas are you wanting to work and improve in? What is one thing you can do today, to grow in this area? Who can you turn to for help?